TRENTON – Dozens of artists, former colleagues, and community members came out to celebrate the work of former Mercer County Community College (MCCC) professors Mel Leipzig and the late Lou Draper during “Trenton Makes: Art and Artists in Trenton,” held June 21 at MCCC’s Trenton Campus. &The reception featured the donation of Leipzig’s painting “Fashion Design, MCCC, Trenton Campus” to the college and the debut of the book “Louis H. Draper: Selected Photographs.” Proceeds from the sale of the book will benefit the Lou Draper Memorial Scholarship Fund at MCCC. 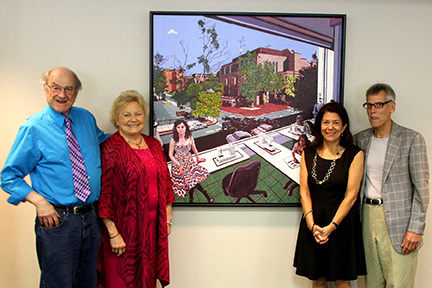 In addition to the donated painting, four other Leipzig works were on display – including “Lou and His Son,” a painting of Draper and his son in his MCCC office – a tribute to Draper during the Father’s Day reception. Leipzig, an internationally-acclaimed artist with paintings in the permanent collections of some of the world’s most prestigious museums, retired from teaching at MCCC in 2013 and has used MCCC settings, faculty, staff, and students as his subjects in numerous paintings. Draper coordinated MCCC’s Photography program from 1982 until his death in 2002. His photography career took him around the world, where he photographed historical figures that include Malcolm X, Langston Hughes, Jacqueline Kennedy, Fannie Lou Hamer, and Miles Davis. His photographs have been exhibited in permanent collections, including the Schomburg Center for Research in Black Studies at the New York Public Library. To purchase Lou Draper’s book, contact Toral Patel at (609) 570-3616, e-mail patelt@mccc.edu. 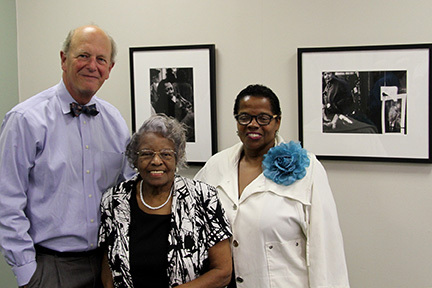 From left, Vice President for College Advancement Ed Gwazda, Lou Draper’s sister, Nell Draper Winston, and Cheryl Pelt, Executive Director of the Lou Draper Trust. 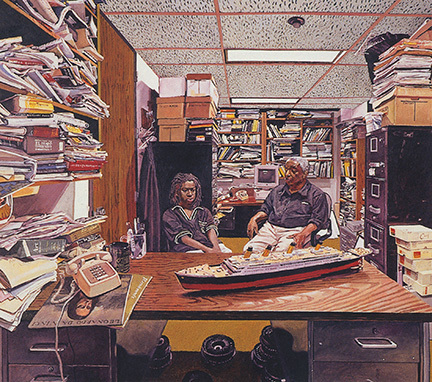 "Lou and His Son," a painting of the late Lou Draper in his MCCC office by Mel Leipzig.